Making tamales is easy once you get the hang of it. Follow this guide and learn how to prepare the corn husks and assemble the delicious Mexican dish It may take you a little longer to make the first few, but after you learn the ropes, you'll have a whole batch ready in no time. Go through the corn husks and remove any debris. Separate the larger usable husks from the smaller bits and pieces. Save the smaller pieces for later—they can be used later for ties or patches. Place the husks in a large bowl and cover them with warm water. Set a heavy item (like a bowl or mug) on top of the husks to keep them submerged. Remove the husks from the water and pat dry. Place into a covered dish or a large plastic bag to prevent from drying out. 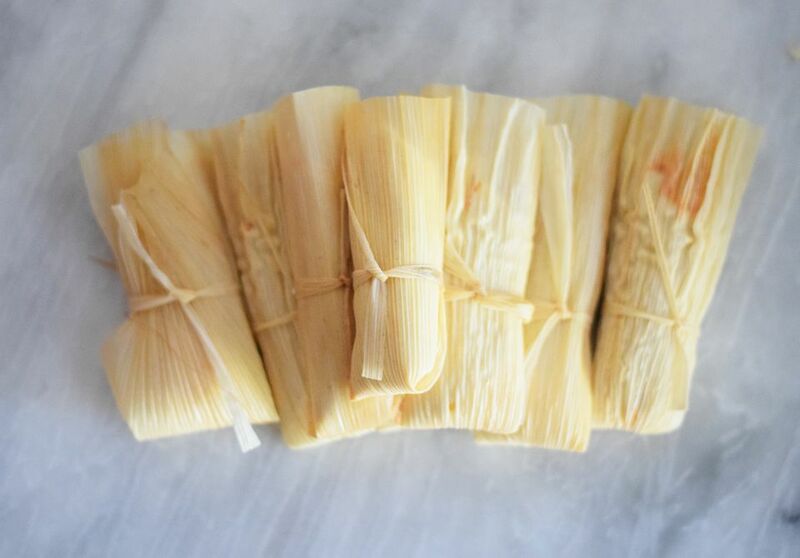 Use only the larger and medium-sized husks for the tamales. When looking at the husk, notice the shape. They have a narrow end, a broad end, and two long sides. Lay a husk on a flat surface. Spoon 1 to 2 tablespoons of dough onto the husk, depending on the size of the husk. Use the back of a metal spoon to spread the dough onto the husk. When spreading the dough, leave a space of about 4 inches from the narrow end of the husk and about 2 inches from the other end. Spread the dough to the edge of one of the long sides and 2 inches away from the other long side. Try to keep the dough approximately 1/4-inch thick. Spread a couple of spoonfuls of filling down the center of the dough, leaving at least one inch of dough around the sides. Locate the long side with a 2-inch space that doesn't have any masa. Fold that over, slightly overlapping the other side, so the edges of the dough meet. Wrap the extra husk around the back. Then, fold the broad end over the top and the longer narrow end over the broad end. Create strips of husk by cutting or tearing 1/4-inch lengths off of some of the smaller or unusable husks. Use these to tie across the middle of the tamale to hold the flaps down. You may need to tie two strips together before tying it across the tamales, depending on how thick your tamales are. You can also use kitchen twine to tie off the tamales. Set the tamales upright in a steamer. You can buy large steamers made just for this purpose, but can also use any available large pot. The key is to have a small amount of boiling water on the bottom of the pot and a colander or mesh of some sort to keep the tamales away from the water. Cover the pot with a lid and steam for 90 minutes. Do not let the water boil up completely. Add hot water to the pot as necessary, but keep it away from the tamales.